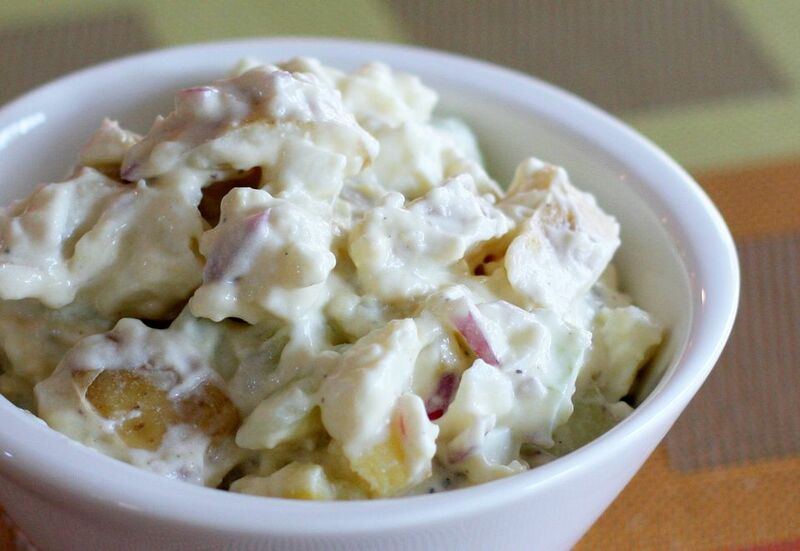 This potato salad might look simple, but it isn't short on flavor. The salad is made with fingerling potatoes and chunks of cucumber and celery. Hard-boiled eggs and red onion are tossed into the mix, along with tasty sour cream and mayonnaise dressing. Put potatoes in a medium saucepan and cover with water. Bring to a boil, reduce heat, cover, and simmer for about 15 minutes, or just until potato chunks are fork tender. Drain and let cool. Chop the hard-boiled eggs and put them in a large serving bowl. Add the chopped red onion and celery to the eggs. Peel the cucumber and slice it in half lengthwise. Scrape the seeds out with a spoon and then dice the cucumber. Add the diced cucumber to the bowl with the vegetables and eggs. Add the cooled potatoes to the bowl and gently toss to combine ingredients. In another bowl, combine the sour cream, 3/4 cup of mayonnaise, and the salt and pepper; stir to blend. Add the dressing mixture to the potato mixture and stir gently to blend. Add more mayonnaise, if needed. For additional color, add some shredded carrot or finely chopped red bell pepper to the salad. A tablespoon or two of sweet pickle relish can add a tangy flavor.